Squirrels polished off a bunch of figs from the tree in my yard this season. It was a bumper crop so I didn’t mind sharing. I’d watch as the critters held the fruit in their little paws and quickly chomped away, usually tossing about half away when full. I swear they even peeled away the skin, dining on the rich sweet fleshy part. Then, they amazed me – they would wipe both sides of their mouth on a limb of the tree before scurrying off! I might have thought this gesture was a fluke but it happened every time. Who knew they practiced such manners? Now the squirrels are feasting on the Hachiya persimmons. 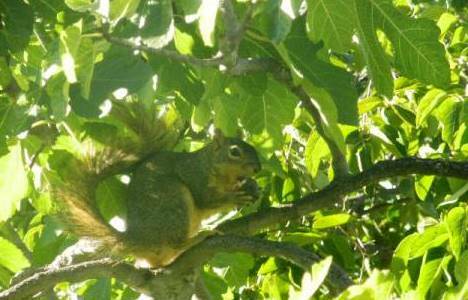 Not as tasty as the Fuyu variety but just as juicy, so my furry neighborhood friends are still using the branches as napkins. Wild decorum. This entry was posted in Green ways. Bookmark the permalink.